HTTP endpoints present your bot as a web service. You'll need to set up a web server to use as an interface for your bot's implementation. Your bot can respond synchronously or asynchronously to these events. Google Cloud Pub/Sub endpoints use a topic on Google Cloud Pub/Sub to relay an event to your bot's implementation. This is useful when your implementation is behind a firewall. Bots that use pub/sub endpoints can only respond asynchronously. Bots that respond asynchronously, which includes all bots on pub/sub endpoints, require a service account to authorize with Hangouts Chat. For a simple, straightforward bot architecture, try implementing a bot using an HTTP endpoint (a web service, essentially) that responds synchronously, always enclosing its payload in the HTTP POST response. This approach does not involve authorization, so it doesn't need a service account. See the simple bot implementation section below for an example of this style of bot. You may need to take a more complex approach if your bot is behind a firewall or sends unsolicited messages such as alarms or other notifications to Hangouts Chat. The following code implements a simple bot in Python using the Flask web framework. """Example bot that returns a synchronous response.""" """Handles an event from Hangouts Chat.""" Because it's a web service, the bot presents an HTTP endpoint and doesn't need to use Cloud Pub/Sub to relay events to it. And because it always returns its response payload within the JSON response, it doesn't need to authenticate using a service account. 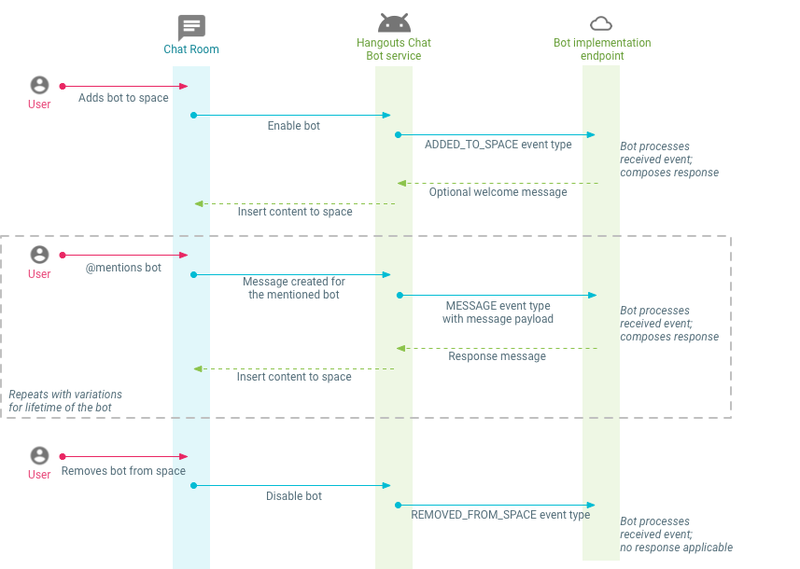 This section describes how to receive and process events that your bot receives from Hangouts Chat. Before your bot can receive events from Hangouts Chat, you must specify its endpoint in the Chat API configuration tab when you publish your bot. Once you've registered the endpoint and published your bot, Hangouts Chat will recognize events addressed to your bot and dispatch them to the specified endpoint. This helps to deter spoofing attacks on your service. Once you've registered your HTTP bot, you need a way for your implementation to verify that the request is actually coming from Google. All bearer tokens sent with requests from Hangouts chat will have chat@system.gserviceaccount.com as the issuee, with the audience field specifying the target bot's project number from the Google API Console. For example, if the request is for a bot with the project number 1234567890, then the audience is 1234567890. You should verify that the request is coming from Google and is intended for the target bot. If the token doesn't verify, the bot should respond to the request with an HTTP response code 401 (Unauthorized). // Bearer Tokens received by bots will always specify this issuer. // Url to obtain the public certificate for the issuer. // Intended audience of the token, which will be the project number of the bot. // Verify valid token, signed by CHAT_ISSUER. # Bearer Tokens received by bots will always specify this issuer. # Url to obtain the public certificate for the issuer. # Intended audience of the token, which will be the project number of the bot. # For example, for 'Authorization: Bearer AbCdEf123456' use 'AbCdEf123456'. # Verify valid token, signed by CHAT_ISSUER, intended for a third party. type: A string that specifies the type of the event. eventTime: A string containing the event timestamp. For published bots, the displayName and avatarUrl fields are always overridden by their corresponding published settings. See the event formats reference for details of the different event types and their request formats. When your bot receives an event from Hangouts Chat, what it does with that event is completely implementation dependent. The bot may look up some information from a data source, record the event information, or just about anything else. This processing behavior is essentially what defines the bot. There are three kinds of events shown in the above diagram: ADDED_TO_SPACE, MESSAGE, and REMOVED_FROM_SPACE. A bot can't respond after being removed from a room, but it can respond to the other two types. A bot can respond to an event synchronously by returning a JSON-formatted message payload in the HTTP response. The deadline for a synchronous response is 30 seconds. A synchronous response from a bot is always posted in the thread that generated the event to the bot. If a bot needs to respond to a user message beyond the 30-second deadline (for example, it may need to report back after completing a long-running task), it can respond asynchronously. This is exactly like sending a spontaneous message as described in the into an existing thread section. To allow your bot to respond asynchronously, make sure to add a service account. Lightweight bots that don't use service accounts cannot respond asynchronously. If an HTTP request to your bot fails (e.g. timeout, temporary network failure, or a non-2xx HTTP status code), Hangouts Chat will additionally retry delivery twice, with at least a ten-second delay between each retry. As a result, a bot may receive the same message up to three times in certain situations. No retry is attempted if the request completes successfully but returns an invalid message payload. This section describes how bots can send arbitrary messages into a space. To send messages as described in this section, a bot must use a service account. This section describes how to send these messages from your app to Hangouts Chat. The specific THREAD_ID is available in the payload of MESSAGE events that your bot receives from Hangouts Chat. Keep track of this ID so that the bot can inject messages into the thread. In many cases, bots may want to post multiple messages related to the same entity into the same thread. For example, a bug tracker integration may want to post all notification messages related to the same bug into the same thread. To achieve this, bots can specify an arbitrary thread key in each request. Messages posted with the same thread key will be grouped into the same thread. For example, the example bug tracker integration above might use the bug ID as part of a consistent thread key. The first notification message for a bug will then create a new thread; all subsequent messages for the same bug will be posted into that same thread. Thread keys are also scoped to a specific bot; if two different bots happen to both post messages using the same thread key, those two messages will not be grouped into the same thread.